(CNN) -- He had a 1966 Volkswagen bus, scraggly beard and a penchant for the arts. She had blonde hair and liked the Grateful Dead. That was all they needed. 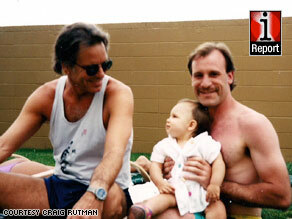 Craig Rutman poses poolside with the Grateful Dead's Bob Weir before a 1997 show in Reno, Nevada. "I knew right away she was not like other girls, other girls," muses Mark Goldfarb of Woodstock, New York, quoting the Grateful Dead song, "Scarlet Begonias." On a fateful day 28 years ago, Goldfarb began a shaggy odyssey of love at a Grateful Dead concert when he literally bumped into his future wife, Diane. Over the years, he has been to more than 125 Grateful Dead concerts. The band literally changed his life. Goldfarb, who now makes moccasins for a living, is excited about the Grateful Dead's new tour. The surviving members of the band will be reuniting for 19 shows this year. He went to see them during their last organized tour five years ago. "What was special about the Dead is you had a group of highly talented musicians who were able to get a sense of the audience," Goldfarb said. "When the audience was off, the band would be off. There was a lot of back-and-forth energy." Back in the late '70s and well into the '80s, Goldfarb traveled the West Coast in a Volkswagen van playing music for a belly-dancing troupe at Renaissance festivals. Along the way, he went to Grateful Dead concerts whenever he could. He sent a photo of his now short-haired self to show the "then and now" contrast. Though he lives now in Woodstock, New York, he missed the two large music festivals in his town. A businessman now, Goldfarb says he feels he's grown up in a lot of ways. The old bus is gone, but he dreams of getting another. "I was a huge fan, I still love the music, but like I said times change. Interests change," he says. Readers across the board said the band has stood the test of time because of the personal connection they brought to the music they played. iReport.com: What does the Grateful Dead mean to you? Indeed, the revival has Craig Rutman of Apex, North Carolina, excited to revisit his past. His brother, a caterer, often provided food for the band and this gave Rutman access to members of the band. He has seen more than 200 shows and been backstage to meet the band. He and his young daughter Laura met bandmember Bob Weir poolside in Reno, Nevada, in 1997. Rutman said Weir is always cordial and friendly. "Whether it was backstage or poolside, whenever I saw him, Bobby always took the time with whoever came by to talk, share a joke or sign an autograph," Rutman said. After the pool-side meeting, the Rutmans attended what would be the toddler's first show. "I sat way in the back of a general admission show to keep her from the crowd and the loud music, but we had a wonderful time nonetheless," Rutman said. Steve Maaske of Omaha, Nebraska, said one of his fondest memories is seeing the band in East Troy, Wisconsin, on the "Wave the flag" tour. He even plans to make the Chicago, Illinois, and Denver, Colorado, stops on the current schedule. It's a good year for a new Dead tour, he says. Greg Sarafan, 19, of Suffern, New York, last saw the band at a summertime Obama rally at Pennsylvania State University. He's hoping to catch them on tour, and says he was amazed to see the diversity of people interested in the band. "I was sitting next to people that were my father's age and older. It was an interesting experience," he said. Sarafan likes to create works of art inspired by the band and has decorated his car with dancing multi-colored bears. He says the music is timeless, and he learned about it from his parents. Like his father many years before him, Sarafan as a young man snuck out of the house to see the Grateful Dead perform. Does Dad know? "He does now," responds Sarafan, who says he was in trouble at first, but things slowly changed between father and son. "When I reminded [my father] that he did sneak away to see the Grateful Dead, he kinda didn't care as much," he said. Geoff Feusahrens of Monterey, California, also represents the younger generation of Grateful Dead fans. He was born in 1979 and never got to see the band in its heyday, but likes classic rock and the Grateful Dead in particular. "I like how they are a jam band," says Feusahrens, who has seen the band perform about eight times. "You go to their concerts and you hang out. There's lots of people there and good music and history and I just fell in love with it." He got married October 11, 2008, and decided to have a cake decorated with a Grateful Dead motif. Though the wedding was mostly traditional, he had Deadhead cufflinks and rock-themed tables at the reception. One of the tables had a Dead theme and "Eyes of the World," one of the band's songs, was played. He plans to see the last show on the 2009 tour when it stops nearby in Mountain View and previously saw them perform during the 2004 series. The band figures importantly in his life. Feusahrens and Goldfarb, too, have in common precious love affairs joined together by the Grateful Dead. Perhaps the band's own lyrics from that same song, "Scarlet Begonias," say it best. "Well, I ain't always right but I've never been wrong. Seldom turns out the way it does in a song."